Richard Rodgers and Oscar Hammerstein II called their soul-stirring 1945 Broadway musical, Carousel their best work. I would call it their most controversial — even more so today under the direction of three-time Tony-award-winner, Jack O’Brien. The musical duo was unafraid of highlighting the arduous realities of domestic violence and, even more, the complex reasons why people stay in abusive relationships. But O’Brien complicates matters in his Broadway revival and adds to its original fraught dynamics the problematic element of an interracial marriage and biracial offspring. The result is the negative reinforcement of the prevalent stereotype of the black man as an underachiever and criminal who leaves his wife with child-rearing responsibilities. 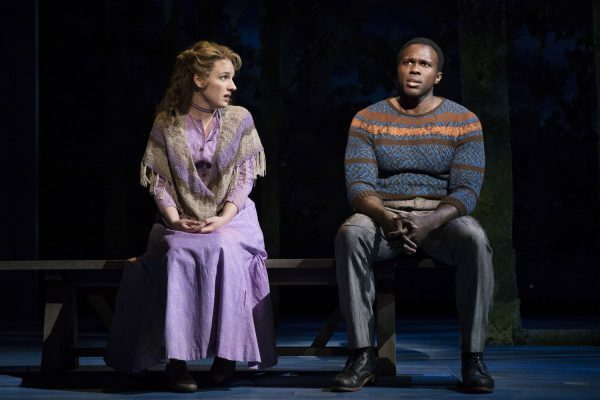 Carousel captures two imperfect characters: Julie Jordan (Jessie Mueller) and Billy Bigelow (Joshua Henry) and their precarious romance set in the late 19th century. The first scene begins at an amusement park where we see Billy subvocalizing as a carnival barker at Mrs. Mullin’s (Margaret Colin) carousel. For the first 10 minutes of the musical there is no actual dialogue, giving focus to the immaculate choreography by Justin Peck in his Broadway debut. The carousel by designer Santo Loquasto is quite disappointing. The traditional amusement ride consisting of horses on a pole, moving up and down in a circular motion is left to the audience’s imagination. Rather, we see the top of the carousel, quite festive with bright lights and colors, as it descends from the ceiling onto the set and the ensemble glides together as if riding horses. It doesn’t work. It lacks the carnival feel we want so much to relive. O’Brien misses the opportunity to revive our childhood memories of riding on carousel horses that move gracefully to the sounds of organ music. Billy, who uses his charm to attract riders, is known to be handsome and charismatic but throughout this production he also comes across as short-tempered, argumentative and cocky, often making devilish eye contact with members of the audience. His body language is used effectively to keep us fearful and at a distance. But it’s a wonder then why Julie doesn’t get the memo immediately when the audience does. We are then thrust into a relationship between Billy and Julie, a frequent rider of the carousel, with no emotional build-up. Even in what is supposed to be the most romantic scene, with Billy and Julie’s sensational rendition of “If I Loved You” and the sweet cherry blossoms falling from the sky, their attraction seems forced and strained. Mueller and Henry’s body language is stiff. Where is the affection, the sheepish smile, the loving gaze, or the warm embrace? If it weren’t for Julie’s best friend Carrie Pipperidge’s (Lindsay Mendez) sense of humor, this dispassionate and rushed first act could have been extremely uncomfortable. Pipperidge’s song “Mister Snow” is not the first song you recall when thinking about this classic musical, however Mendez makes it a sure stand-out in this production. She brings much needed comic relief to a seriously painful scene by making the song light and funny. While Billy Bigelow’s race is not prescribed in the text of the musical, casting a black man, Tony-nominee, Joshua Henry, is a notable change. Henry is a riveting Broadway leading man and he’s long overdue to take on this kind of canonical musical theater role. However, this also creates a new cultural dimension to the storyline. His casting may, on the one hand, increase diversity in leading roles on Broadway, however Billy is unemployed, lacks good judgment and is characterized as an abuser and a criminal. In these terms, this casting could be seen to lean into troubling stereotypes. This gets reinforced further in the production by Billy’s only friend and confidant, Jigger Craigin (Amar Ramasar), a habitual criminal offender, also being played by a man of color. Then Julie and Billy’s hot and cold relationship is juxtaposed with the traditional, well-planned, upwardly-mobile lifestyle of Carrie and Enoch Snow (Alexander Gemignani). (Happily, casting Mendez–a Latinx performer who should also be killing it in these classic roles–allows for diversity without playing into stereotypes). Enoch proudly sings of his aspirations for wealth: “Carrie, I’m gonna get rich on sardines. I mean, we’re gonna get rich. You and me and all of us.” By Act II Enoch fulfills that promise to her. Carrie and Enoch symbolize the American Dream and in this production quickly become the favored couple. For Carrie and Enoch, the creation of wealth is the benchmark for success in a marriage. Whereas for the volatile relationship of Billy and Julie, the conception of their child finally brings them closer together and elicits a purpose in life for Billy. For the first time in the musical, one witnesses a loving connection between the couple when Julie reveals to Billy she is pregnant. During “Soliloquy,” Henry completely nails being vulnerable and authentic for the first time in this production. Billy, in preparation for the birth of his child, professes that he would do anything to support her. “I’ll go out and make it, or steal it, or take it, or die,” he sings. Billy’s rudeness up until now was, it turns out, simply a show of bravado. While this production of Carousel has a number of Broadway’s greatest performers and voices, Peck’s choreographed scenes are the most impressive. During Act II (now 15 years later) with Louise (Brittany Pollack), teen daughter of Carrie and Billy, and Fairground Boy, the object of her affection, their ballet is lovingly playful. Their bodies rhythmically flow together in unison. Their “relationship” appears innocent and pure. On a stage absent of objects with simple lighting, the audience is drawn completely to the young couple. Rodgers and Hammerstein’s musical offers in-depth character development, beautiful and emotive music including the tear-jerking “You’ll Never Walk Alone.” But this production lacks the intense interpersonal connections between the characters that make Carousel one of Rodgers and Hammerstein’s most emotionally complex works. It instead feels like the director is carefully dancing around the idea of romantically linking an interracial couple. We end up hating this Billy because he’s a brute and feel sorry for poor Julie who got swept up in a whirlwind affair. O’Brien’s revival comes at a highly sensitive time. Abuse and sexism are not easily overlooked and there are few roles written for actors of color in classic theater. But O’Brien is not speaking to 2018 audiences with his choices. He’s trying to slip these critical issues into this work without thinking through the substance of them or their impact. Sadly, this production might send you on a merry-go-round of unwelcome emotions you’ll quickly want to get off.